You already know how to cook. Isn’t it high time you learned how to cook with cannabis? Cooking with marijuana does not need to be difficult or time consuming. After taking my course you will make edibles that not only save money over commercially made edibles, they provide the exact dosage you need in food that you like to eat! If you have an ordinary kitchen and basic cooking skills, you already have everything you need to become a successful cannabis cook…except possibly the know how. Until now. 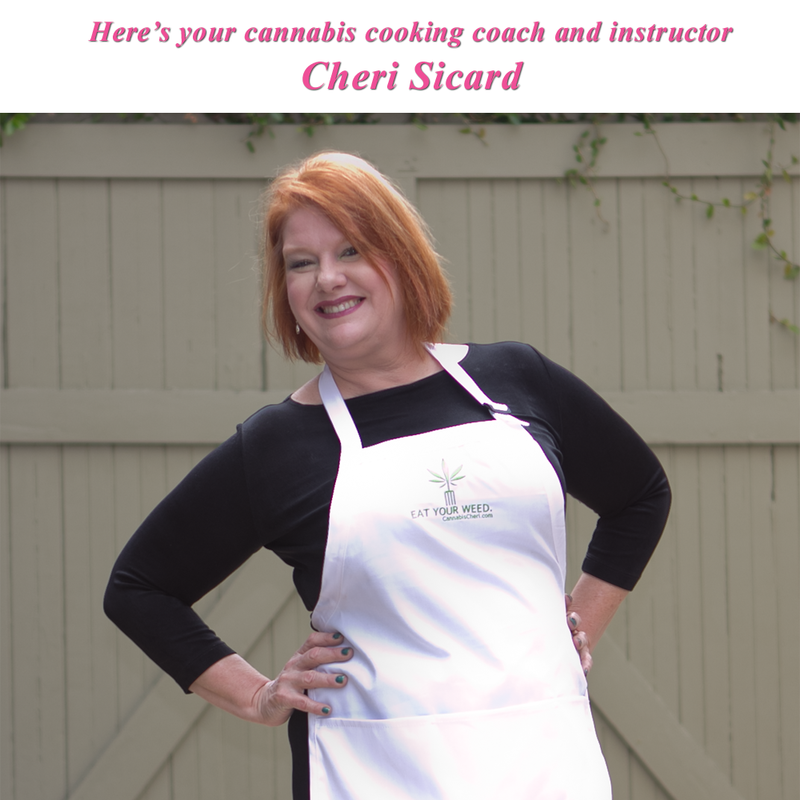 Cheri Sicard has been transforming Southern California medical marijuana patients and home cooks into competent cannabis cooks during her live cooking classes for years. Now you can learn from Cheri on your schedule, from anywhere in the world via your computer. Have you ever wasted marijuana while making edibles? 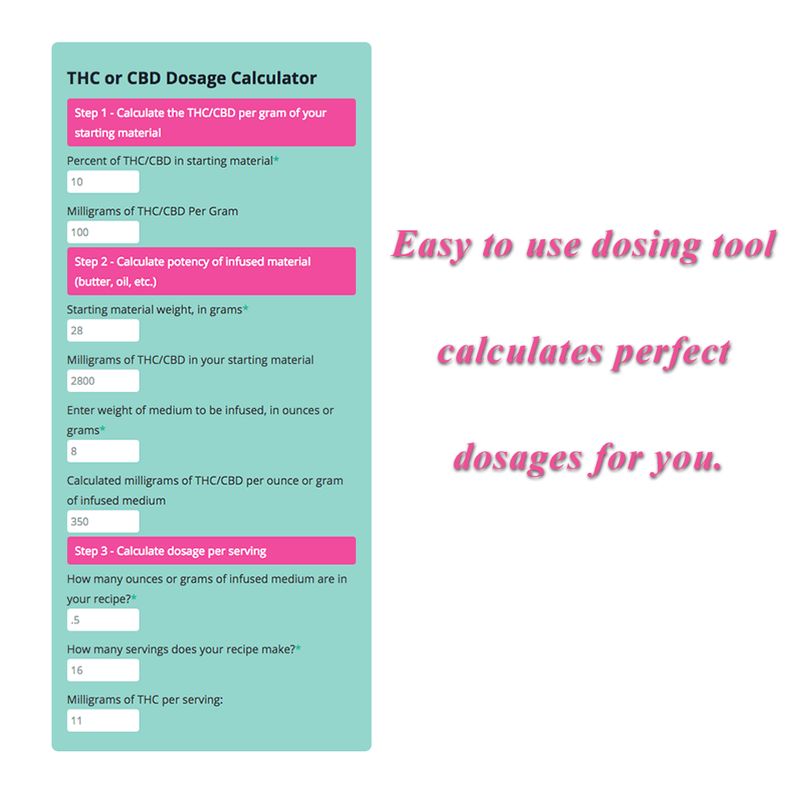 Maybe you made over-dosed or under-dosed batches? Or you made edibles that tasted awful? Maybe you even burnt your butter and had to throw the whole mess out? With Cheri as your personal cannabis cooking coach, never again! This course includes over 2 hours of video instructions, broken down into 29 short easy to watch lessons you can do on your time. You'll also get written notes, quizzes, resources, and some awesome cannabis cookbook bonuses too (see below). If you have questions or concerns, Cheri is always there to help, it's like having a friend, who also happens to be a marijuana expert, you can email for advice. 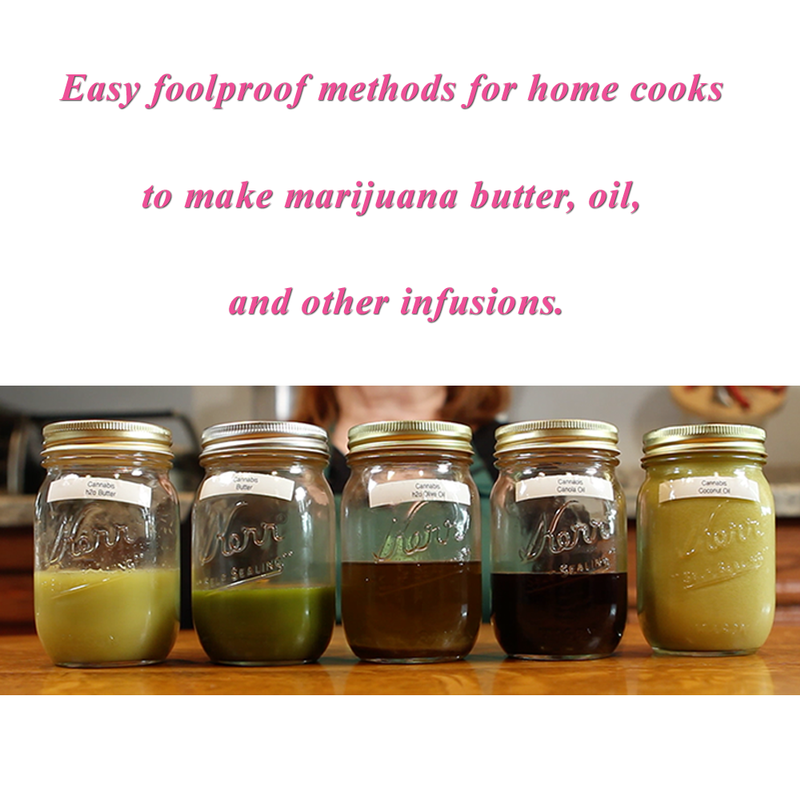 The Best, Most Foolproof Marijuana Infusions for Home Cooks! As infusions form the backbone of most cannabis cuisine, in this course you will learn how to make five different, popular infusions. Each infusion method is foolproof and easy for home cooks to make with kitchenware you probably already own -- no need for expensive special machines or gadgets, with the optional exception of a slow cooker (something a lot of people already have). With video demonstrations and detailed instructions, Cheri compares and contrasts slow cooker, stovetop, and double boiler techniques both with and without water added. You see the results to help you decide which infusion methods are right for you. The techniques can be used to make marijuana butter as well as all kinds of edible marijuana oils. Unlike Cheri's live classes, you can take this marijuana cooking course anytime it's convenient for you. The course is entirely self paced so you can learn as much or as little at one time as you like. You have the ability to skip around and watch the lessons most important to you when you need them. And even though this course is about the same price (or in some cases less) than a live cooking class, you get lifetime access! That's right, you can refer back to the lessons any time you want and as many times as you want. You will also automatically get free access to any revisions, updates, or new features we add in the future. Your participation in this class can be discreet and private; or you can optionally choose to access the Cannabis Home Cooking private Facebook group where you can ask questions, share your edible cannabis creations, and interact with Cheri and other fellow students. It's totally up to you. Cheri is always available to answer questions privately via email for those who opt for discretion. That’s not all. When you register for the course, you will also get lots of tasty, tested marijuana recipes. 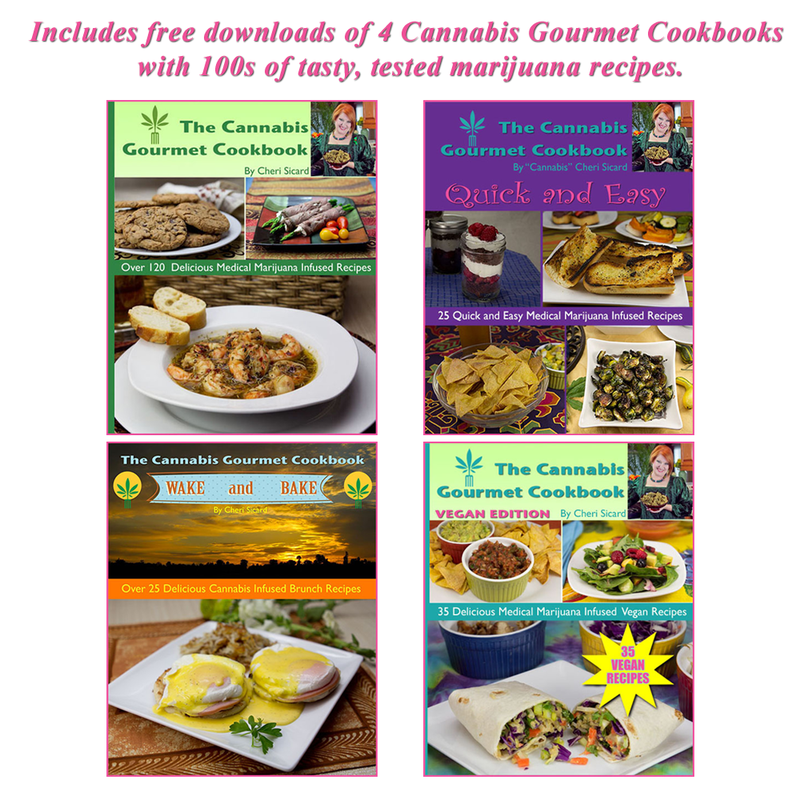 You’ll also get FREE downloads of Cannabis Gourmet Cookbook special edition e-books including: The Cannabis Gourmet Quick and Easy Cookbook, The Cannabis Gourmet Wake and Bake Cookbook, and the Cannabis Gourmet Vegan Cookbook. 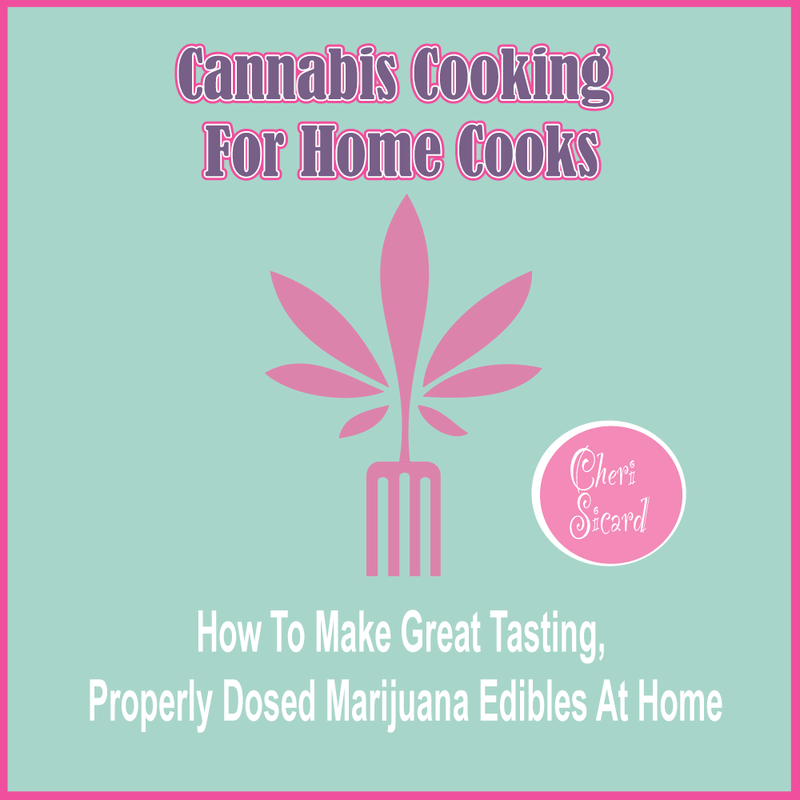 Access to the Cannabis Home Cooking private Facebook group where you can ask questions, share your edible cannabis creations, and interact with Cheri and other students. Regular invitations to Free live online webinars and hangouts with Cheri and other cannabis experts and chefs where can further your cannabis cooking knowledge. For the price of a single live cooking class, you get lifetime access, the cookbook bonuses, and ongoing cannabis cooking education. Cheri Sicard was a professional food writer, recipe developer, and cooking instructor long before cannabis entered her life, so it was only natural she started cooking with marijuana after her doctor recommended it for a chronic condition. At the time there was little good information available so she penned The Cannabis Gourmet Cookbook, which took some of her most popular recipes and turned them into tasty medibles consumers can easily make at home. Soon Southern California medical marijuana dispensaries were calling on her to teach their patients about cooking with cannabis. Cheri’s second cannabis book, Mary Jane: The Complete Marijuana Handbook for Women, released in 2015, is a great general guide to marijuana and the cannabis lifestyle that has helped scores of women come out of the cannabis closet. Cheri writes Freedom Leaf Magazine’s monthly Medicated Munchies column, and her articles and cannabis recipes can be found in High Times, Civilized, Cannabis Now, Herb, and more. Cheri and her books have been featured in The Huffington Post, the Daily Beast, Time, Bustle, Dame, She Knows, The Cannafornian and a host of other publications. The Daily Beast even dubbed Cheri the "Martha Stewart of Weed." Additional Requirements: This is a digital online course. You will receive a direct link and an activation/coupon code along with detailed instructions how to access the course upon completion of your purchase. Additional Requirements: This is a digital online course. You will receive a direct link and activation/coupon code along with detailed instructions how to access the course upon completion of your purchase.